Junior forward Ajdin Penava makes one of his four blocked shots on the night. Penava continues to lead the nation in blocks. BOWLING GREEN, Ky.— More than 7,300 fans filed into E.A. 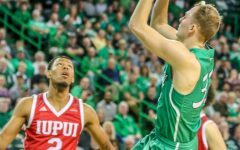 Diddle Arena Saturday night to witness a Conference USA men’s basketball showdown between the Marshall Thundering Herd and the Western Kentucky Hilltoppers. 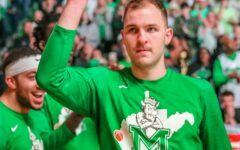 After a physical, foul-laden 40 minutes of play in front of a sold-out crowd, the Herd fell short, 85-74. With the win, WKU completed the regular season sweep over Marshall, after defeating Marshall Jan. 6. 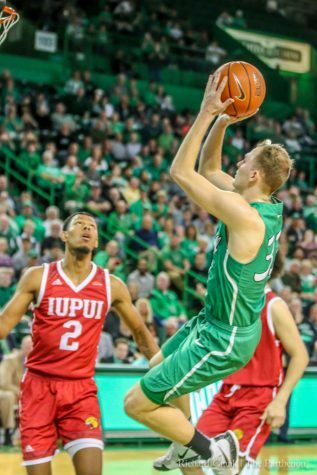 Illness and injury plagued Marshall in its first meeting with WKU, leading to a lopsided 112-87 loss at the Henderson Center—its worst defeat and first home loss of the season. Coming into Saturday, though, the Herd was full-strength. The result was anything but lopsided. Junior guards C.J. 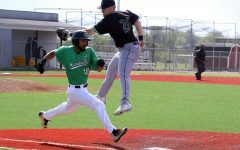 Burks and Jon Elmore led the offensive charge for the Herd. Burks shot 60 percent (6-for-10) from beyond the arch and 62.5 percent (10-for-16) from the field. The reigning C-USA Player of the Week scored a game-high 29 points, leading the Herd in scoring for the fifth-straight contest. Elmore scored 19 of his own, combining with Burks for 48 of Marshall’s 74 total points. Elmore also shot 90 percent (9-for-10) from the line and led the team with nine rebounds and six assists. 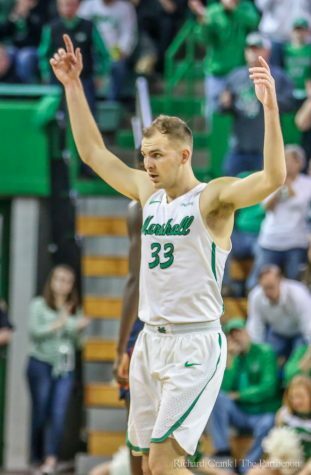 The Herd trailed for most of the game, as WKU’s defense wouldn’t relinquish the lead until 12:12 in the second half, when Burks drained a three to give Marshall a 59-58 advantage. 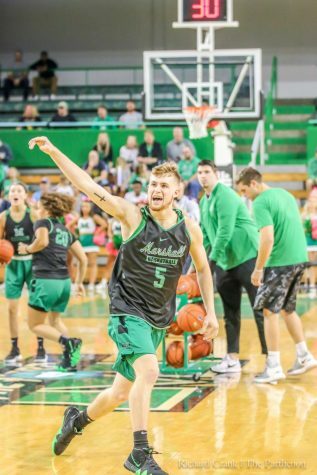 After WKU guard Taveion Hollingsworth was called for a technical foul with 4:39 remaining, Elmore hit four straight free-throws to give the Herd a 74-70 advantage—its largest lead of the night. WKU responded, though, with a 15-0 scoring run. Marshall went scoreless for the rest of the game. Defense was key, as baskets came at a minimum for both teams. 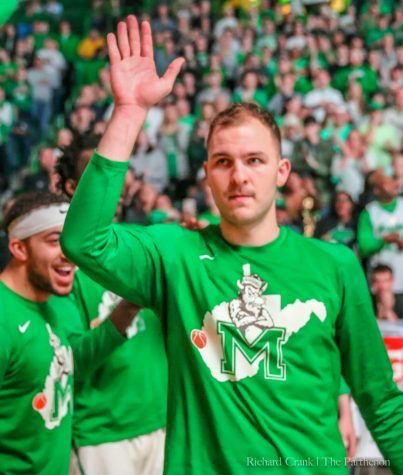 Overall, Marshall shot 40.6 percent (26-for-64) from the field and 31.3 percent (10-for-32) from beyond the arc. Comparatively, the Hilltoppers shot 47.6 percent (30-for-63) from the field and made 38.3 percent (5-for-13) of its three-point attempts. 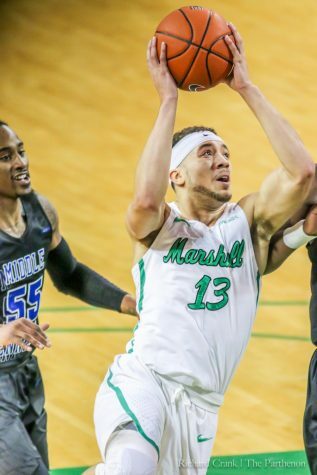 Aside from shooting troubles, size and physicality—especially inside the paint—worked to Marshall’s disadvantage. 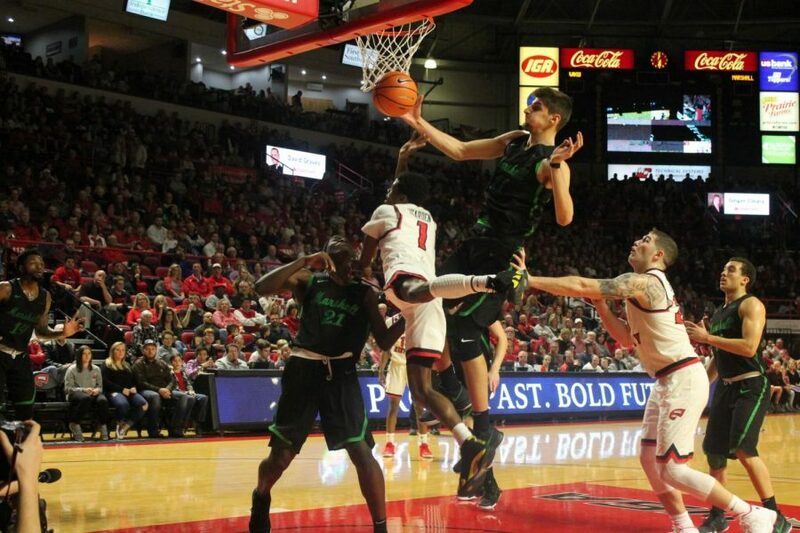 With 46 points in the paint, the Hilltoppers nearly doubled Marshall’s total of 26. 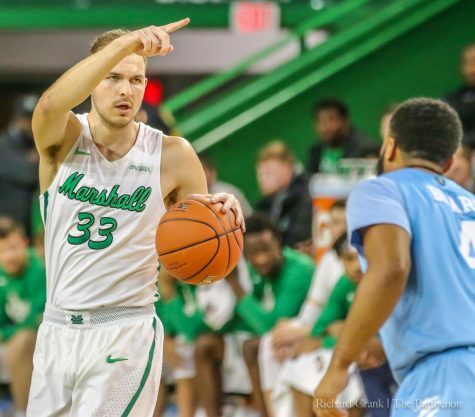 Additionally, Marshall committed 27 personal fouls—20 of which WKU converted into points via free throw—as junior forward Ajdin Penava and freshman forward Darius George both fouled out before playing a full 20 minutes. Marshall’s size woes were a theme all night. 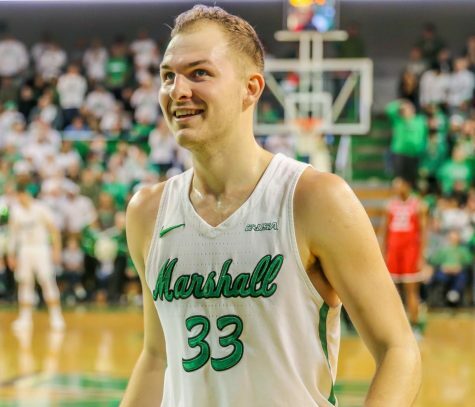 The Herd’s 6-foot-9, 205-pound freshman forward Jannson Williams earned his third-career start and maintained size balance between the two teams. However, Williams left the game permanently after falling hard and suffering a leg injury within the first five minutes of play. “We have to keep our big men on the floor a little longer,” D’Antoni said. “We lost Jannson (Williams), our other big. So, we were basically playing with four guards and a light forward. For WKU, size helped win the game. Starting forwards Dwight Coleby and Justin Johnson, WKU’s largest players, dominated the Herd in the paint. The 6-foot-9, 245-pound graduate student, Coleby, scored 18 points and yielded 13 rebounds for a double-double. Johnson, a 6-foot-7, 245-pound senior had eight points and 12 rebounds of his own. 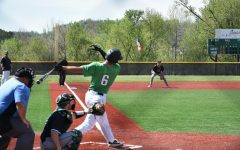 With the loss, the Herd fell to 14-7 (5-3 C-USA) and holds sole possession of fourth place in the conference standings. WKU improved to 15-6 (7-1 C-USA), tied with Old Dominion for second place in the standings. 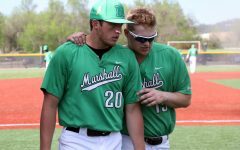 Marshall will travel to Texas next weekend to face UTSA (11-11, 4-5 C-USA) Thursday and UTEP (7-14, 2-7 C-USA) Saturday.